In my attempts to relax a little bit and get back to normal life after the two weeks of insanity that was Worldcon 76, I had breakfast at the Wigwam (spending the money I won yesterday) and went bowling at the Frontier Fun Center. That's the best game I managed. Still too much Worldcon on my mind. 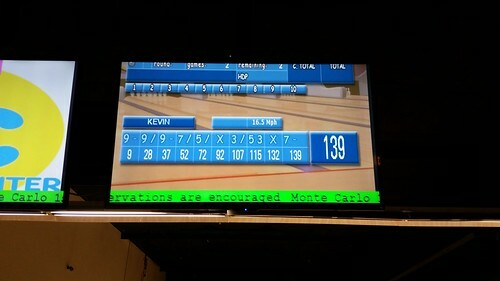 But I did manage to get >300 for three games. Today I spent a long time reading a large backlog of messages dating back to before Worldcon started, but I'm still not done. And I did help Lisa a little bit with the home improvement projects that we can do now that the weather isn't so mind-numbingly hot.